The purpose of this tutorial is to walk you through the process of using a Raspberry Pi as a web server. When I am designing a theme for WordPress I always install a copy of WordPress onto my local server. I have my server set up in a virtual machine. It’s aggravating because I have to wait on that virtual machine to start up before I can do anything. I have been thinking about installing Apache, MySQL, PHP and phpMyAdmin onto my Mac so I can just leave it running and have a copy of WordPress running locally for whenever I need to test something. I just haven’t had the time to do this yet. On my Linux virtual machine I have a copy of XAMPP running. I got to looking around and there is a version of XAMPP for the Mac but it only runs on Intel Macs. The iBook that I have has a PowerPC G3 processor, so that won’t work. Fortunately there is an alternative called MAMP. It’s got the basics of XAMPP and works pretty well. I downloaded it this morning, extracted and installed it. I guess I should say what XAMPP and MAMP are. They include Apache, MySQL, PHP, phpMyAdmin and a few other things all in one package. They’re usually meant for developers on a network to test out projects and usually not meant for deploying websites publicly. You usually just install a package and you have a web server. In under 20 minutes I was able to have WordPress up and running. It would have been quicker had I not run into a database connection issue. Also, the download was quite large, over 100 megabytes so I had to wait on that. The database problems that I ran into was that you can’t simply use ‘localhost’ as the MySQL server address, you have to use a port. I tried to use ‘localhost:8889’ but that did not work either. I then used the IP address of the machine ‘192.168.1.44:8889’ and that worked. This is a great option for testing websites. 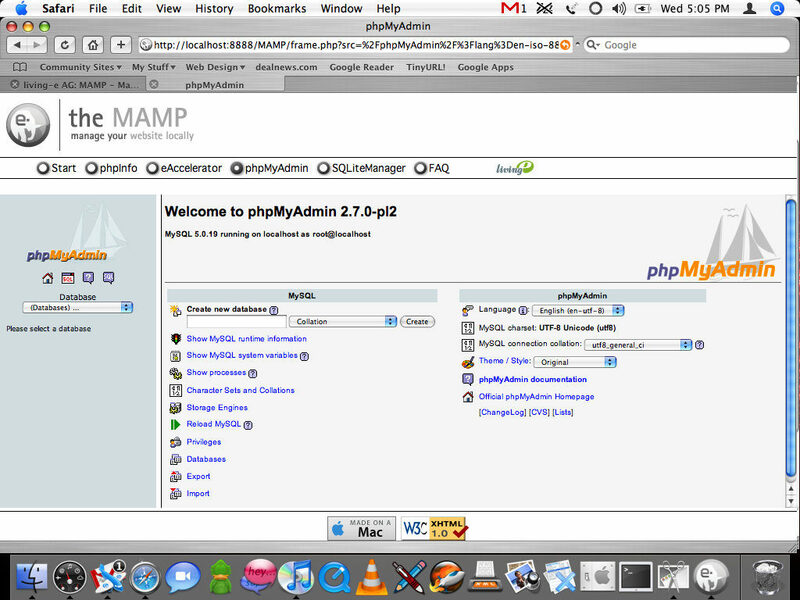 I haven’t looked into it yet but if MAMP can be secured then I think it would be a good option for someone wanting to play with hosting their own websites or blogs. If you use XAMPP on Linux then you’ll know that you can easily secure XAMPP by running a simple command from the command line and answering a few questions. 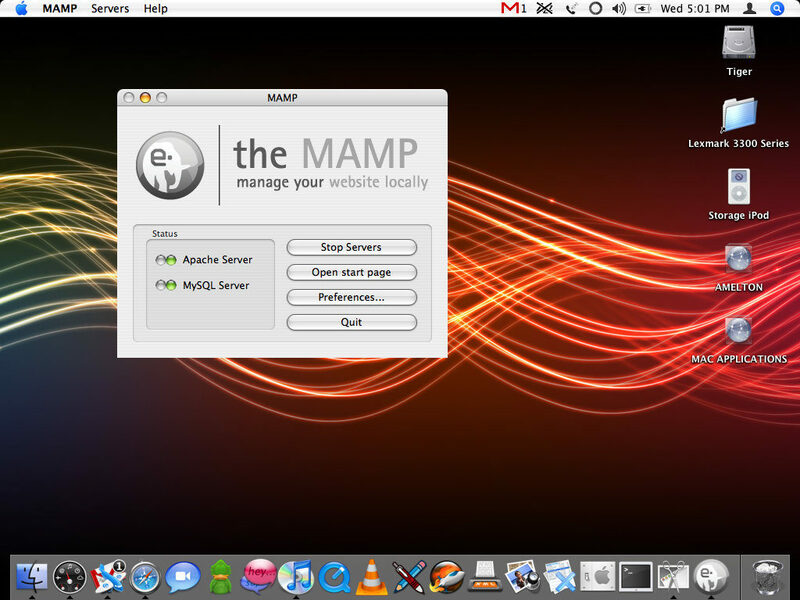 However, if MAMP can’t be secured then I think it’s still a good option for testing websites locally. Other than making sure XAMPP is secure you’ll want to install an FTP server. There is an FTPd daemon already included in OS X. You can use PureFTPd Manager for Mac OS X to manage it. If you’re not on a Mac I would recommend Uniserver or XAMPP.